Major land reforms were implemented in Japan after World War II. 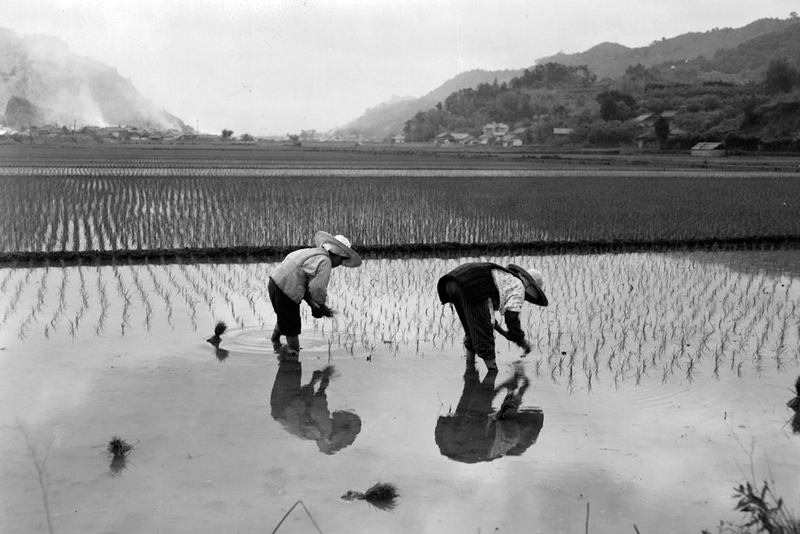 The above picture shows rice farmers in Kochi in 1955. Wolf Ladejinsky, an economist and agriculturalist who fled the Soviet Union in 1921, helped Japan and Taiwan implement major agricultural reforms that led to the countries becoming completely self-sufficient in food production. These reforms also ensured that these countries stayed largely capitalistic. Over the lifespan of the Soviet Union, several dissidents and refugees reached positions of eminence in the United States. However, few of these former Soviet citizens ever managed to implement communist-inspired policies to counter communism itself. This is where Wolf Issac Ladejinsky stood out. Born in Ukraine (which was then a part of the Russian Empire) to a reasonably wealthy family in 1899, Ladejinsky lived a comfortable life until the Bolshevik Revolution, when his father’s businesses were expropriated by the government. He fled the country and entered the U.S. as a refugee in 1922. Quickly learning English, Ladejinsky enrolled in Columbia University, where he earned a BA and then did a graduate degree in economics. “His publications on the collectivization of agriculture gave the world a rare Russian perspective into the policies that were taking place at that time,” Vikas Chandran, a former agriculture specialist at the World Bank told RBTH. In 1935, Ladejinsky joined the U.S. Department of Agriculture, choosing to focus on foreign agricultural issues. He continued to study the Soviet model, but also paid attention to agriculture in Asia, particularly Japan, India and British Malaya (which includes Singapore and the modern-day peninsular Malaysia). “He increasingly saw land distribution and redistribution as the key to political stability,” Ben Stavis, Director, Asian Studies Program at Temple University, wrote in a paper. In his pre-World War II writings, Ladejinsky stated that Japan’s occupation of Taiwan and certain parts of Northeastern China were largely on account of land hunger created by an existing feudal system in the country. In 1945, he joined the staff of General Douglas MacArthur, who was the Supreme Commander of the Allied Powers in post-war Japan. He advocated a peaceful redistribution of land in the war-ravaged country. Under the Ladejinsky-MacArthur land reforms, more than 5 million acres were taken from large landholders and sold to former tenants. Stavis attributed the smooth transition to the fact that the landlords could not organize private armies and resist the policies of the occupation forces. The farmers who received the distributed land formed the bedrock of support for Japan’s Liberal Democratic Policy. The combination of political stability and a hard working farmer community helped Japan become an agricultural powerhouse. At the closing stages of the Chinese Civil War, Ladejinsky tried to help the Chinese Nationalists hurriedly implement land reforms but it was too late. He moved to Taiwan and introduced the policies on the island. The authorities on the island welcome the idea of implementing the land reforms since it would weaken the rural power structure, which was a potential obstacle for the Nationalists. Both in Japan and Taiwan, the landlords were given industrial bonds and this helped both countries rapidly industrialize. Later in his career, Ladejinsky met with lesser degrees of success in India and other Asian countries. He spent most of the last decade of his life in India as a World Bank consultant. Ladejinsky grew increasingly critical as the Indian Government's grand proposals for land reform became weakened by political convenience and competing priorities, according to a New York Times report written after his death in 1975. “Until the peasantry begins to vote in its own interest, the chances are that integrated agrarian reforms in this part of the world by due process of law will be almost impossible” Lajedinsky wrote in 1971. More than five decades after his death, the very process of land reforms still evokes strong emotions in Asia. However, his flexible and calculated approach in the continent helped the U.S. stop the spread of communism. The fact that Lajedinsky was born in the Soviet Union and advocated land reforms and helping the rural poor made him a suspected communist in the eyes of U.S. Senator Joseph McCarthy. Despite being an advocate against communism, Lajedinsky lost his U.S. government job in 1954. A year later, he was reinstated by Dwight Eisenhower administration, which admitted that a mistake had been made.